In the Newfoundland and Labrador of bygone days, anyone who played for a dance was called the fiddler, whether they played the accordion, fiddle, harmonica, or sang. Mrs. Clara Belle Fennelly (née Ryan) is a fiddler who plays the accordion. Well known by all up and down the Southern Shore, she has provided music for square dances, garden parties, concerts, weddings, and events for more than eighty years. The wonderful and unique Newfoundland dance tunes that she has preserved and shared can now be heard on CDS by Daniel Payne, the Dardanelles, Emilia Bartellas and Aaron Collis, the STEP Fiddlers, and Christina Smith and Jean Hewson, and in local sessions. Mrs. Belle was born into a family of singers and musicians on December 14, 1919, in Aquaforte, on the Southern Shore. As a young child she took up the accordion and by the time she was eight was already playing for dances at the home of Mrs. Phine White. There she learned dance tunes from Mrs. Phine, Bill Jones, and visiting sailors and fishermen off the banking schooners who would attend the dances when in port. She learned many tunes from the radio as well: blessed with a prodigious memory, she often could repeat a tune after hearing it only once. In this manner she rounded out her repertoire with everything from The Blue Danube Waltz to In The Mood. 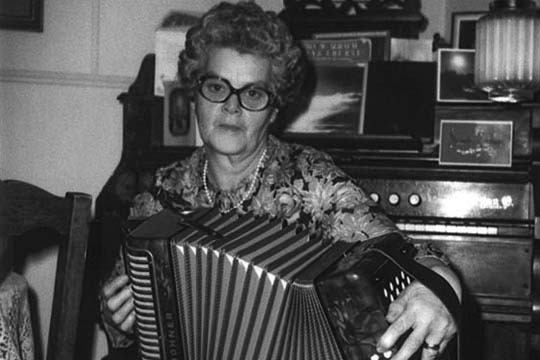 Her first accordion was bought with the money earned from playing at dances and cutting cod-tongues. At the tender age of 14 she left Aquaforte and moved into St. John’s to care for her ailing sister and her children. After her sister’s death she worked at several jobs including cook and housekeeper in the home of William Howley, who held the portfolio of Justice under the Commission of Government, in order to support the family while her brothers were away at war. Frequently she would return home on weekends and play for the Saturday dances. It was at one of these Aquaforte dances, “in the round house” as she loves to relate, that she met Raymond Fennelly, the lightkeeper at Bear Cove Point. They married in 1948 and were partners in both the square dance and in life for the next 59 years. Mrs. Belle spent 14 years in the lighthouse, and then the family moved to Port Kirwan, where Mrs. Belle opened her own shop “because 6 children weren’t enough to keep her busy” her daughter Sharon laughs. The shop served as a community focal point. In between serving customers, she would play accordion for youngsters after school. By night the store would serve as a location for weddings and dances. After it closed in 1985, Mrs. Belle continued to play for garden parties, concerts, events, and reunions. Her skill on the accordion and her repertoire of Newfoundland dance tunes has made her kitchen a magnet for local and international musicians, folk dancers, fiddlers, accordion players, folklorists, all of whom she has welcomed for tunes, tea, moose stew, and her famous fruitcake. Mrs. Belle now lives at Fahey’s Home in Fermeuse. At the age of 94, she still plays every day.